Breaking arms. That's what we learned in class today. More specifically, we learned two arm breaking methods that are fast, quick and effective. With a little practice, anyone can do it. 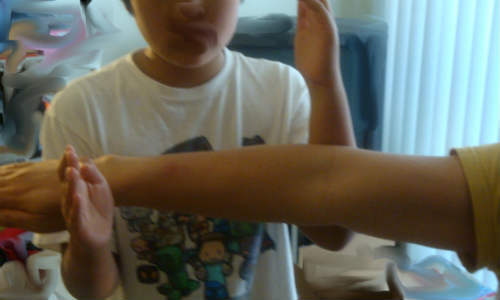 It’s important to point out that in Wing Chun we're actually doing an elbow break. In a hand-to-hand fight it’s not necessary, or practical, to break the arm (break the bone), like what happens if you crashed your car. What’s faster and easier is breaking, tearing up, or ripping apart someone’s elbow joint by forcing it to bend the opposite way, or in a direction it's not meant to bend. Warning to those with a weak stomach: I've heard that when you break an arm right, it makes a loud gut wrenching sound as the tendons and ligaments rip apart from the bone. You'll also know you're doing it right by the blood curdling screams the other guy makes. Use this advanced move on those who deserve it, like a sociopath or serial killer. Wu Sao hooks wrist. 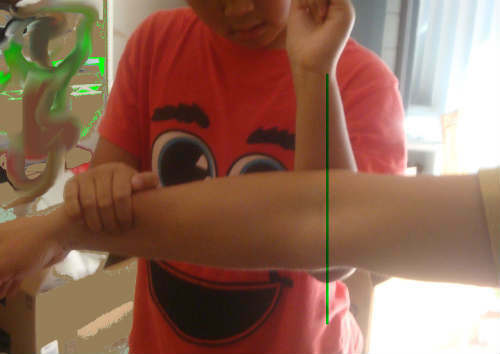 Elbow/forearm snug on joint. Grab wrist. 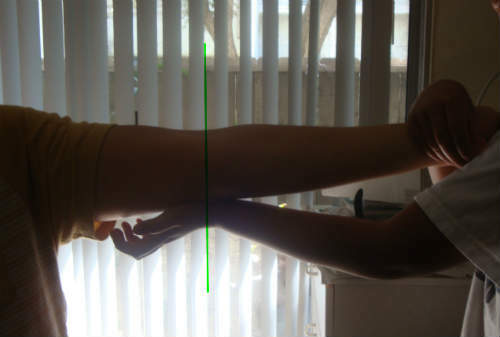 Elbow/forearm square behind joint. The first arm break we practiced hooks (with a Wu Sau) or holds/grabs the opponent’s arm at his wrist. Then, using your other elbow-forearm smash into the opponent’s elbow joint from opposite its bending direction. The more perpendicular (right angle) the force is applied, the more predictable and better result you'll get. A few things can go wrong. 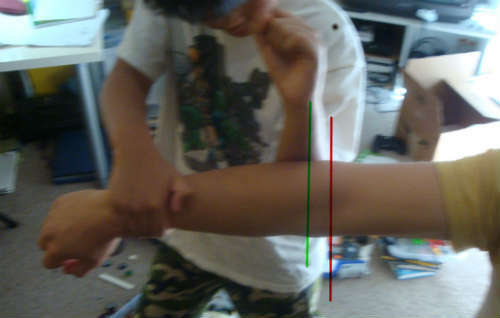 In the image below, although the force is properly aligned against the elbow joint (red line), the body weight is not directly behind it (green line). Remember, our joints are very strong. To properly break the joint, you need to get maximum force and proper leverage on that joint's weak part and rip it apart. As you can see from the image, the force in this case would be almost all arm and shoulder strength. If you're much bigger or stronger than the thug you're fighting, you may be able to get away with it. But don't take chances, let leverage work for you. The best way to do this is to get your mass directly behind the force needed to destroy the joint. The breaking force and body mass is nice and tight behind the joint. 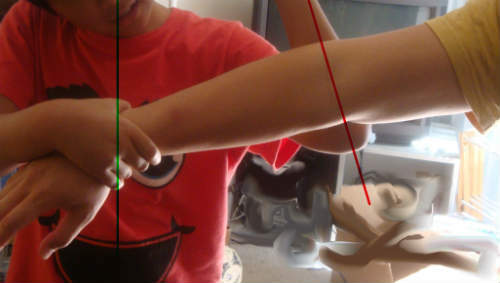 In the image below the mistake is that the force is not directly on the elbow joint. It's off center just a bit. If you're smaller or weaker than the predator you need to put down, a few centimeters could be the difference between life and death. Let the science of leverage work for you. Attacking elbow/forearm is slightly off the joint meant to break. The second arm break hooks the opponent’s arm with a Fook Sau (pushing down) while the opposite the palm, or blade-of-the-arm, uses a Tuk Sau (pushing up) to strike the elbow from opposite its bending direction. This is not my favorite elbow break because it's not effective to actually rip apart the joint. 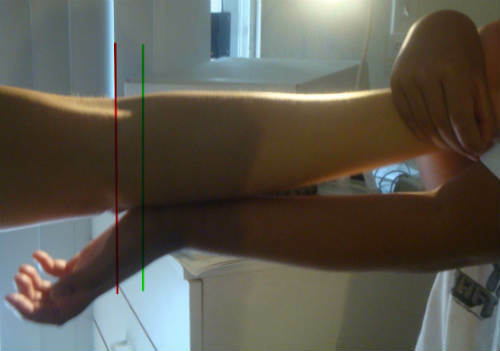 However, if you extend the joint enough (more details about this below) you could hyper-extend it and cause discomfort. But it's not as sure as the first arm break; and I don't like taking chances. Keeping the alignment is just as important in this joint break, as it is in all of them that use this method to break joints (applying pressure at the weakpoint, in the opposite direction as the joint moves). Another downside I find with this break is that there isn't much you can do about putting more of your body mass behind the break. The best you can do is brace your Tuk Sao arm against your body (keep you elbow tight onto your torso) so it's more stable and doesn't wiggle or give in while you deliver a solid strike/break. You cannot break the elbow backwards when it’s bent in it's natural position (range of motion). You could, but it would take too much work for an unpredictable result. When you hook/hold the psychopath's wrist you are NOT just holding the arm in position. That’s not enough. You want to extend the arm because when you do, the elbow is at its most vulnerable and weakest position - it's easier to break. In both arm break methods above you want to pull or tug the opponent’s arm (with your bracing arm) so that it’s extended straight and vulnerable to your attacking arm. We've established that it can’t be used against a bent arm. It’s also not useful against quick strikes like jabs. So it may not be a good idea to reach out and grab the arm and force it into a break. That may just turn into a wrestling match. Instead, use it against over committed attacks where the arm is extended, like a wide or long punch. What's even better is to soften up your opponent first by hitting or kicking him. While he's injured and distracted you can quickly attack the arm and break the joint before he knows what’s going on. Mastering joint breaks gives you an advantage because a broken joint doesn't function. It does not matter one bit how much determination or will power or qi gong energy the other guy has. He cannot use a broken joint to harm you. Period. Often joint breaking knowledge (and joint locks) is made very complex. There are hundreds of ways to break the wrist for instance. There are entire martial arts like bjj that focus almost entirely on joint locks and breaks. But the fundamentals are very simple. Move the joint past its natural range of motion and it will break (rip and tear apart). That's it. No magic or mystery. Just high school level physiology. How you do it doesn't really matter,either. Move the joint past its natural range of motion and it will break (rip and tear apart). If you really want to master breaking arms and all the joints in the body, this is my favorite non-Wing Chun specific resource to learn how to do it quickly, efficiently, simply, and with predictable success.